Stowe is one of the most highly regarded of the East Coast resorts and this is mainly due to the attractive 18th century New England town. It is a favourite venue for the richer city-dwellers, who like to pop up for a few days at a time. This can create weekend queues. 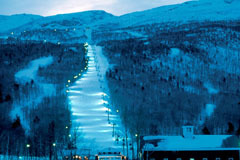 The small scale of the ski domain can be covered in a short stay. 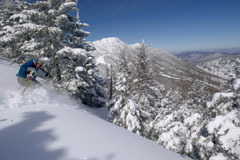 The 2 mountains, Spruce Peak and Mount Mansfield, have some good but limited terrain for experts (the 'Front Four' are truly awesome), tree-lined cruising for intermediates and superb tuition and slopes for beginners. Boarders are very much in evidence at Stowe. 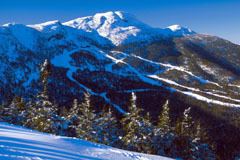 The snow record is better than other Eastern resorts and the snowmaking facilities are excellent. There is some piste-side accommodation, but most stay a few miles away in Stowe. This demands a short journey each day that can be slow when the traffic builds up. Ambience is Stowe's major selling point and there are plenty of shops and restaurants set in traditional New England buildings. Après-ski is largely well-mannered, as befits its clientele. Stowe is 330km from Boston and 140km from Montreal. Details of lift pass prices for 2002/3 will be published as soon as they are announced.